Let's not even forget the return of the IJGBs. In case you don't know, this is Naija lingo for our Brethren that reside outside the Country and come back to motherland around Christmas. You can't miss them. They find a way to include "I just got back' in every conversation. (Don't ever take the bait and ask "from where?". It's a rookie mistake - don't say we didn't warn you). Let's not even talk about the constant complaints about everything(as if they didn't know the state of things before they left) or the accents - real and fake. That's story for another day. What mostly riles me up are the guys and the way they assume that once you know they are 'IJGB' you are supposed to be all over them. They believe they are everything that matter to you in a partner so, you should cater to their every whim. Such delusion! And then they think it's okay to call you all kinds of pet names - Mama, Shawty, Sugar, Mummy or Nne(according to our Ibo brothers)all to impress. It's just ridiculous. I'm not averse to pet names, I just don't like it when someone I barely know calls me Baby. I'm not your Baby abeg. Is it just me? Am I the only one who gets irritated by the airs and graces? What happened to just being your normal self and letting the girl like you for who you are? Oh well, to each his own and according to my friend, I hope they are bringing their own fuel as they are coming back to Naija. They shouldn't come and shorten the small ration we have and further hike up Cab prices. 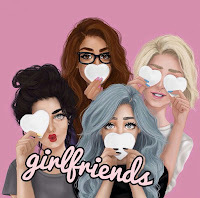 Happy Holidays everyone and in the mood of celebration, Girlfriends will be giving out freebies for every purchase as from the 10th of December. Details will be posted on our Instagram page @thegirlfriends. Lol @ IJGBS. It is the random guy calling me baby j hate so much. I remind you my name immediately. If we aren't almost lovers or relations, don't baby me joor!